Two emails landed in my inbox within days of one another. One was from The Green Guide (formerly one of my go-to sources for unbiased, green-living advice, they've recently been bought by National Geographic, so the jury's still out on how good they'll remain, but I'm hopeful). The other was from The Health Sciences Institute (HSI). 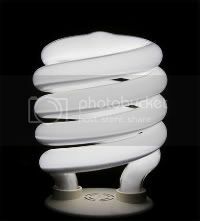 Both emails addressed the pros and cons of CFLs (Compact Flourescent Lightbulbs) (and yes, there are cons). I have been using CFLs in my home for a couple of years now, and have been pleased with my lower energy bills, not to mention the glow of environmental responsibility. Especially since we typically leave the lights in the bedroom on all day so our pug won't get left in the dark. But last night, the first one burned out, and I got to test out just what it meant to have the possiblity of a mercury spill in my home. I was terrified! I came home to find that one bulb was out, and the other bulb was casting a shadow that looked like it might be a pile of mercury dust sitting inside the shade. I immediately began to feel a dryness in the back of my throat, and was that a momentary headache? (Yes, I do have a pretty good imagination.) A masked investigation proved that the bulb hadn't broken, and there had been no mercury spill in my bedroom, but it was a pretty harried few moments until then. And had the bulb broken, my pug would have been in big trouble, since he spends most of his day in the bedroom.